The wait is over!! At long last, here it is: Free pattern – Strong Heart. Available in long and short versions, as mittens or as fingerless gloves. I experimented using a softer yarn in the below version using Zealana’s Rimu, and they’ve come out beautifully. These gloves feature cabled hearts travelling up the back of the hand. A smaller cable echoes the hearts over the thumb. The rest of the glove is in stretchy double rib, which allows a reasonable range of hand sizes to fit them. Gauge: 22 sts x 28 rows in stocking stitch on 3.75mm (US 5) needles. 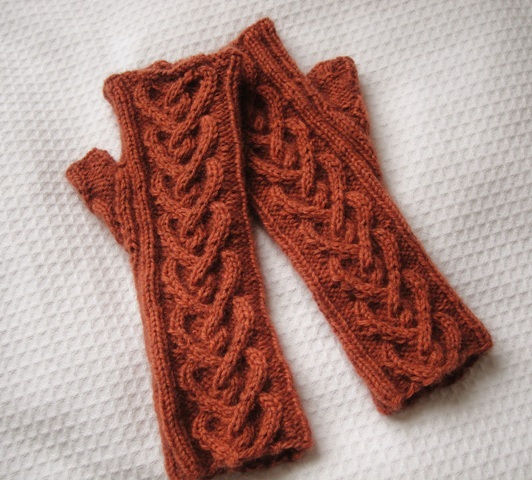 I think they’ll make lovely gifts for Christmas, but perhaps you’ll enjoy a cabled treat for yourself too!?? If you’re interested in the back story, it’s here. And finally, as hinted at in my last post, because I’d love to share the experience of knitting with these gorgeous New Zealand yarns: A small giveaway competition. Be in for the chance to win two balls of Zealana’s Rimu in the Riverbank* colourway shown above by posting a comment about why you want to knit with possum yarn. You must mention either “Zealana” or “possum” in your comment so I know your comment is for this prize. Be in for the chance to win two balls of Stansborough’s Mythral in Kokako Grey* by posting a comment on which movies you know Stansborough Grey wool has featured in. You must mention “Stansborough” in your comment so I know your comment is for this prize. I’ll draw a winner for each category by random number draw, and assuming your answers are correctly provided. I’ll be sorting the comments for the draw per brand – so if you want to be in the draw for both Zealana and Stansborough, you’ll need to leave two comments, one for each brand. Comments will close at midnight, Sunday, 2 September NZ time. The competition is open to all, and I am happy to post anywhere within New Zealand or internationally. * these yarns are from my own stash, and there is no choice of alternate colour. Categories: Designing, Finished Objects, Free patterns, Possum, Stansborough, Wool | Tags: designing, free pattern, giveaway, Knitting, Stansborough, Strong Heart, Wool, Zealana | Permalink. So possum is one thing, and gorgeous itself, but that Zealana! I’ve squooshed it, but not knit with it….some day. Also, it escaped me that you were doing this pattern as a free one – thank you EXTRA much! I can think of several of my friends that could do with them. Is life always so difficult, or is it just that I’ve been noticing it recently….? 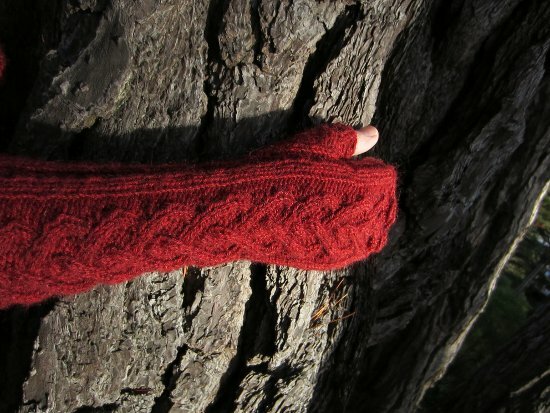 I have never even touched possum, would love to have a chance to knit it, your mitts are gorgeous! Stansborogh looks gorgeous, but also I have never even touched it, it was featured in Lord of the Rings! Ever since I read that Stansborough was used to make the Hobbit’s capes in The Lord of The Rings trilogy, I’ve wanted to try some of the yarn. I have not found it here in the States. I’m a big fan of the color grey….in high school, that was the only color I wore one year… I would LOVE to win this yarn! And I just printed out the pattern…love it! This design is stunning and you are so lovely to offer the pattern for free. I just recently organized my stash and know that I should expand my repertoire (even though I have too much stash already)! I’d love a chance to knit with possum – I know how much you love it! I found some Zealana at a local yarn store…I haven’t used it yet…but will try it for these, because well it is meant to be! But I’d love to win some more, as it really isn’t a yarn that we do see often. I was intrigued that it had possum in it and read up on it…I like trying unusual fibers and have buffalo, dog, and yarn made of other interesting fibers in my stash…. I would love to be in the Zealana drawing! Possum is something I would love to knit with, as there is nothing like that around here. I’ve read on many blogs how wonderful it is. I would also like to give the Stansborough a try! Like already mentioned, I find it awesome that they used it for The Lord of the Rings. Anyone know what things they used it for? The costume department for those movies (and the upcoming The Hobbit) is ridiculously talented! Possum sounds perfect. I have always wanted to have a go with that. What a lovely pattern too! I love possum yarn, it seems to become softer the more you work with it. There is a cowl pattern I have lined up with some Zealana yarn too. Fantastic … you are a genius and an angel! I would love the chance to use this yarn though it is probably unlikely living in the uk and I never win anything, though I feel I have almost had a win as you have so generously put this pattern up for free. I would love to try this yarn after your praise for it and not least because if it being kind to the eco-system – environment is something I really care about as you know. Well done on your fantastic design and on having such a kind heart. That Zealana looks gorgeous. I made a pair of socks with a bit of possum in them, sooo soft and lovely, would love to knit with possum again!! I already have some possum yarn in my stash and now I will use it to knit some strong heart mittens. Thanks for the pattern! As I buy almost exclusively from a very small local yarn shop, the owner and I have been discussing possum yarn for some time. First I had to do the tutorial that you did on how possums in the states are not possums in Australia, and then she was interested. She has been chatting it up a little so that she can justify ordering a batch instead of a skein. Winning would give me the chance to show and share at the shop. Please please please, me me me! Fantastic … you are a genius and an angel! I would love the chance to use possum yarn though it is probably unlikely living in the uk and I never win anything, though I feel I have almost had a win as you have so generously put this pattern up for free. I would love to try this yarn after your praise for it and not least because if it being kind to the eco-system – environment is something I really care about as you know. Well done on your fantastic design and on having such a kind heart. I fell in love with Stansborough grey before I knew what it was. It took me a long while to find out what it was, helped by your blog which I stumbled upon all that time ago. I’d managed to find out that it was used for the costumes in Kidnapped and then later discovered that it was also used in the film adaptation of C S Lewis ‘The Chronicles of Narnia’ which I had grown up with and Tolkien’s ‘Rings’. If I were lucky enough to win it I would be thrilled. The thought of knitting with yarn that someone may well have been knitting with/using in Viking times makes my toes curl. A really great aspect of this yarn for me is the sustainable way the producers farm and have prevented a rare breed from extinction. What a privilege it would be to knit with this yarn! Thank you for sharing your story! I hope your mum’s arm continues to heal. The mitts will help – I sometimes get achey wrists and having some warmth around them makes it more comfortable. 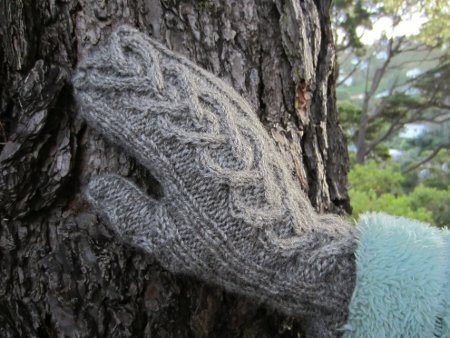 I would love the opportunity to make your beautiful mittens with some soft possum yarn! I’ve never felt or seen how possum knits up, so it will be a knitterly adventure! they are absolutely beautiful, thank you for the beautiful pattern and the lovely back story. Congrats on getting the mittens out! I know you’ve worked very hard on them. They are absolutely beautiful special strong heart mittens, I know it is difficult to knit. Everyone will like them. They are very special, everyone will like them very much. Yay! I’ll cast them on soon. Thanks for the pattern, I know how much work it takes writing and editing them, not to mention testing and adjusting. I would love to try possum yarn because I’m a curios person and always looking for new adventures. Thank you so much for this giveaway! Make sure you post a picture of the project! I’d love to see your finished result. How lovely. I have a 3/4 sleeve length alpaca sweater I am planning to knit and had planned on knitting a pair of elbow length gloves to go with them … And I will knit yours! Thank you for sharing! thanks for the gorgeous free pattern! I love Stansborough yarn and have been a bit obsessed with it ever since seeing the lovely woven elven cloaks in the Lord of the Rings films. if I remember correctly, their wool and woven (and perhaps knitted?) items have also been in one or more Narnia films. I wasn’t such a big fan of those, but I do remember loving Tumnus’s red scarf! Thank You for the free pattern, I’m new to Zealana Yarns, in fact I haven’t knitted with it yet. I seen an ad on FB from Strings in NYC for the limited edition pearl yarn for Vogue’s 30th anniversary made by Zealana and was able to get a skein, beautiful. I’m still waiting for my Vogue Magazine to knit the scarf pattern. Looks like the Zealana yarn is dist. through Yarn Sisters here in the US so I will be going and checking out Possum and Stansbough (don’t think I got that right) and see the different weights it’s available in. I keep hearing about more of the pearl yarn being made in different colors and weights (hope so) it’s a beautiful yarn. Here’s a little possum story for you. I grew up in a small community on Banks Peninsula. There was dear old lady around the road from us (Mrs Ensor) who used to trap and shoot possums that were destroying her fruit and native trees (let’s face it all Kiwis know that the only good possum is a dead possum ….). Because she was elderly and frail she wasn’t able to dig a hole to bury them afterwards. Her solution was to put the possum int he boot of her mini and take a drive. When she got to a suitable spot she’d open the boot and dump the body on the road … making it look like road kill. I have always thought how ingenious she was and admired her for doing her little bit toward conserving our native bush. I love the pattern. Someone will definitely be getting the fingerless gloves for Christmas this year. I’ve used Zealana before and love it. Have some in my stash. I think I will also make the mittens to go with a hat. I haven’t used Stansborough before, but look forward to it. I just love this pattern, thank you for sharing! I am very interested in trying the Stansborough yarn, it looks lovely. I’ve been doing tons of research for my New Zealand trip lately. I am feeling so overwhelmed because there is so much to see in your beautiful country and there’s no way to fit it all in in just a few weeks. But I am so grateful to even have the opportunity! These look beautiful. Thank you for sharing the pattern. I have a blogging friend in America who has never seen or knitted with possum yarn so I would send her the Zealana yarn to help spread the word about its wonderfulness. It would be a lovely gift to say thank you to her for all her comments on my blogs. I’ve looked longingly at Stansborough Mythral yarn but the budget was going to stretch on those occasions. It was featured in The Lord of the Rings films…. Being a New Zealander living away from home, I love Zealana’s Possum yarn, its so soft and reminds me of home. I have two sons who are huge Lord of the Rings fans. I love to make something for them from the Stansborough Grey. Ooooh, can’t wait to knit these up. Now, just to decide which daughter will be gifted with them first, or if I should knit up two pair and put them back for Christmas. I love the fact that the Stansborough Mythral yarn was used in so many of our favorite movies – Narnia’s – The Lion, the Witch and the Wardrobe and Prince Caspian, The Waterhorse, Avatar, and Lord of The Rings. What a lovely pattern and, especially considering how much work you have put into these, it is so kind of you to make the pattern available for free! I would love to be able to make the mitts in the Zealana possum yarn – beautifully warm for our cool southern mornings and evenings. Great colour, too! A bonus to know that it is also helping to keep the possum population in check. After having read some much about it on your blog, I would also love to have the opportunity to knit these cute mitts in the fabulous-looking Stansborough yarn! It looks such a warm and cosy yarn – perfect for this pattern. Thans SO much for the beautiful (free) pattern! They immediately went into my fall knitting list. You must be so excited for spring down there in NZ, while we here in the Northern US are gearing up for fall. Thanks again for the lovely pattern!